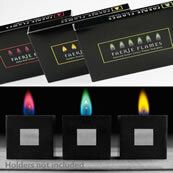 Tealights in metal holders liven up any tealight holder with their pretty coloured flames. X09 451 (7361) Faerie Flames 6 tealights - Red Flame (standard tealights with metal cases). Inner: 12 boxes. Carton: 48 boxes. X09 452 (7362) Faerie Flames 6 tealights - Green Flame (standard tealights with metal cases). Inner: 12 boxes. Carton: 48 boxes. X09 453 (7363) Faerie Flames 6 tealights - Orange Flame (standard tealights with metal cases). Inner: 12 boxes. Carton: 48 boxes. NB The wooden tealight holder in the main photo above are not for sale - just the candles!